I've always been a fan of Valentine's Day. Mostly because it's just a few days before my birthday and because it's an excuse to eat candy and get dressed up. Glitter Guide decided it would be fun to celebrate the love you have for the women in your life with a girls' night in. Thanks again to all the girls who helped put this shoot together and to Michelle Drewes for her amazing photography/videography skills! Head over to Glitter Guide to see the rest. so cute! love the idea!! What a fun idea! Get all my girlies dressed up, wine and dine, 'til someone taps out! hahaha love this look...colorblocked V-day it is! That looks so much fun, lovely ladies! Fun! If anyone knows how to celebrate this holiday it's you guys. Your outfits are so bright & cheerful. Love it! I love it! I decided to wear pink ad red on Tuesday after reading this post!! Such a cute video! I love it. I also love the idea of a girl's night for V-Day! 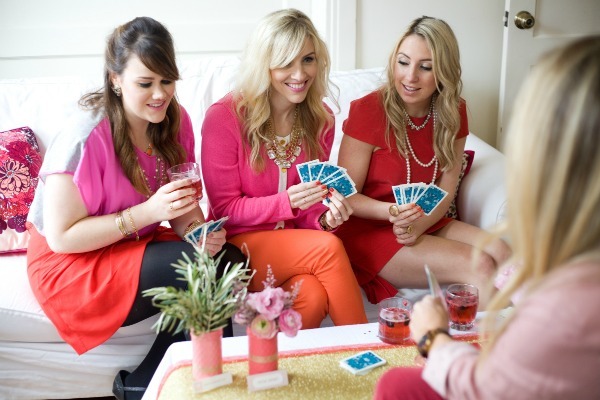 Playing cards+drinking champagne?! I'm in! You all look so cute, I love the outfits! What a great party! Great tips and ideas. Love it! looks like some really great ideas for a fun girls day/night! You all look absolutely ADORABLE. The clothes are amazing. This sounds like such a blast! Wow this is so cool. Bet you girls had a good time sharing fashion tips. so fun! What a glamorous little soiree! Girls' night out is always fun, love every detail in tehe video. I love the video and the pink! Lovely color combination and necklace.